After a looong absence, here is the latest episode of the FTD podcast. This time, we talk to Peter Grensund and Jens Finnäs, who write data-driven news stories at the Stockholm arm of Journalism++ (J++). Among many other things, Jens has a great resource site (sorry, Swedish only) about data journalism and Peter has won a prestigious award for a “mortgage map“, a visualization of mortgage rates in different parts of Sweden. The term “data journalism” (or precision journalism, database journalism etc.) Peter and Jens emphatically stated that they are first and foremost journalists, perhaps just a bit more data literate than average. After all, all journalism is about collecting information, weighing it and telling an interesting story. The career prospects of a data-driven journalist. Which media companies are the most forward-looking in Sweden in terms of these things. How the barrier to entry is actually quite low. It is not difficult for a journalist to learn how to use data resources. In the second episode of the FTD podcast, we talked to big data consultant Johan Pettersson (his company is actually called Big Data AB; what a catch to be able to obtain that name despite the Swedish trademark regulations!) and Thomas Hartwig, CTO of King.com, a company that produces “skill games” where you can win money by being more skillful than your competitors. Johan Pettersson does not think the demand for big data specialists or data scientists in Sweden is that high at the moment (although everyone is talking about “big data”, almost no one is really working with it), but it will probably be in 1-2 years. However, good data analysts are in high demand and therefore hard to find. Follow the Data podcast, episode 1: Gavagai! Gavagai! 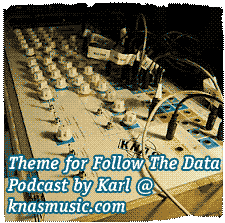 We have made available the first episode of the Follow the Data podcast! Hope you enjoy it. Podcast link: Follow The Data | Episode 1 – Gavagai! Gavagai! This first episode, as has been mentioned before on this blog, is about a Stockholm startup company, Gavagai, which provides a technology platform called Ethersource. We interviewed the company’s CDO (chief data officer), Fredrik Olsson, and the chief scientist, Magnus Sahlgren, and we think it resulted in a very interesting chat, although the sound quality is perhaps not ideal due to our inexperience with podcasting. The name “Gavagai” comes from a thought experiment by Quine demonstrating the “indeterminacy of translation“. It’s also the reason for the presence of the little rabbit on the Gavagai web page. Ethersource learns meaning from text, which is the core of the technology; use cases include “sentiment analysis on steroids”, textual profiling and market analysis. As a result of the underlying design, Ethersource builds up representations of concepts as it incorporates new data; Gavagai formulates this in the phrase “training equals learning.” The concept-based approach means that the system is extremely good at handling spelling errors and synonyms. Ethersource is not based on concepts such as “documents” or “tweets”, which are completely artificial, according to chief scientist Sahlgren. The system’s design also means that it does not have any problems handling different languages, even languages that use different text encodings. Gavagai did not start out as a “big data” company but they are now relatively comfortable in their role as one. Fredrik Olsson used to work for Recorded Future, which he feels is not a competitor to Gavagai, but would be a perfect customer. The Gavagai founders have a radical view of linguistics, where there is no hard line between syntax and semantics, but rather a kind of continuum. They don’t believe in sampling, but try to ingest everything they can find into the system. The Gavagai team tries to put aside some time every day to look at interesting concepts and connections between concepts discovered by the system. They expected that a word like apple (Apple) would have a large number of different meanings, but when they looked at data from social media during a specific period in time, it had just three major meanings. Language does its own disambiguation; for example, after Apple has become well-known as a software company, people have started to talk more about “apples” rather than “an apple” when they mean the fruit (if I interpreted Magnus correctly). In the evening of the day of the interview (March 9, 2012), Swedish daily Svenska Dagbladet released an article about Gavagai’s Ethersource-based real-time sentiment tracking of the buzz around the contestants who would appear in the Swedish Eurovision finals the following day. In the end, the Ethersource forecasts turned out to be very accurate. Although it’s far from clear what the next episodes of the podcast will be about, in general we will restrict ourselves to interviewing interesting companies or scientists (rather than just talking amongst ourselves), with a bias towards Swedish interviewees since this is where we are located and it might be interesting for people from other locations to hear what is going on here. EDIT 17/3 2012: Our podcast jingle was created by Karl Ekdahl, the man behind the awesome Ekdahl Moisturizer, among many other things.